Fresh Corner Cafe, $20,000: Available at more than 35 locations in southeast Michigan, Fresh Corner Cafe is a food distributor working to ensure that all Detroiters can easily access affordable, healthy meals. Digital Inclusion, $15,000: Digital Inclusion is a computer refurbishment, technical support, and technical training program operated by Eastern Michigan University that is dedicated to incubating the ideas of young people to foster entrepreneurship. DIIME, $5,000: Design Innovations for Infants and Mothers Everywhere (DIIME) is on a mission to combat maternal and infant health disparities through the design and commercialization of appropriate, affordable, innovative devices. Java Hope Project, $5,000: The Java Hope Project helps women break the cycle of poverty through business development. Michigan Garment District, $3,000: Michigan Garment District brings local goods to market by training and giving jobs to underemployed populations. RNS Packaging, $2,000: RNS Packaging is a veteran-owned, Michigan-based company that provides 100 percent biodegradable customized packaging for consumers and retailers. EcoIntelligent Homes, $10,000: EcoIntelligent Homes conducts audits that help small businesses and homeowners improve energy efficiency. ReSource Fund, $5,000: The ReSource Fund serves low-income communities in the Ann Arbor-Ypsilanti area with equitable financial services. This $3,000 prize sponsored by the Magic Johnson Foundation was awarded to Patronicity, a localized crowdfunding platform that connects small businesses, organizations, and events with patrons and sponsors. 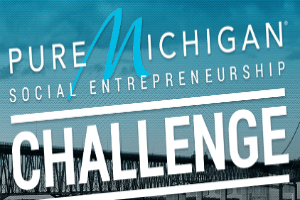 Sponsored by the MEDC, the $25,000 Community Ventures Award went to a social entrepreneur impacting structural unemployment in Detroit, Flint, Pontiac, or Saginaw. The winner, Vanguard Property Preservation Enterprise, provides job opportunities for unemployed Detroiters—particularly citizens returning from prison—through the cleaning and maintenance of private-owner eviction and foreclosed properties.